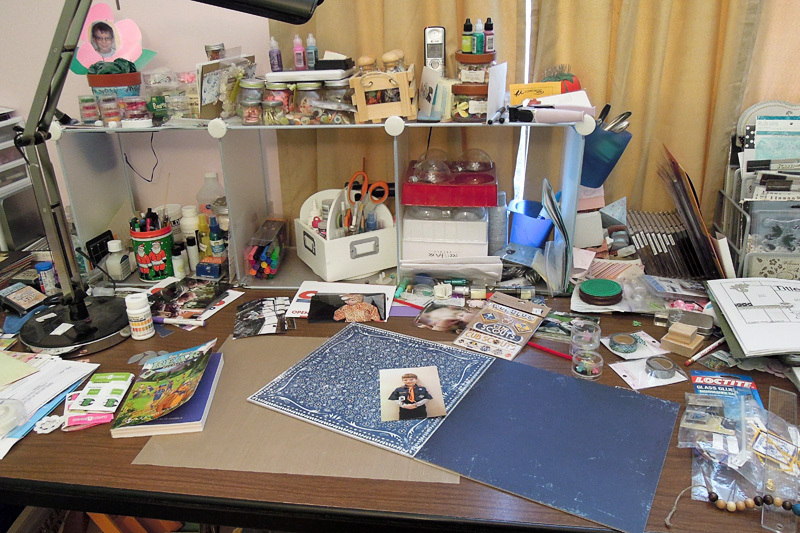 Here’s what my table looks like today for What’s on Your Workdesk? Wednesday. Not much of a change is it? I skipped my usual challenge this week since it was a specific kind of card and I’m NOT a card maker (OK, I’m something of a baby too!) What you can’t see is the Cub Scout uniform shirt on my chair that I need to sew patches onto. Aleene’s Tack-It Over and Over is good for more than just making your cutting mats sticky again, it will hold patches for a while too. Since Halloween is just around the corner I thought that I would update my pumpkin treat bag for use with eCAL and SCAL3. I mostly just made little tweaks and I added a shape to use as an inside panel behind the face. 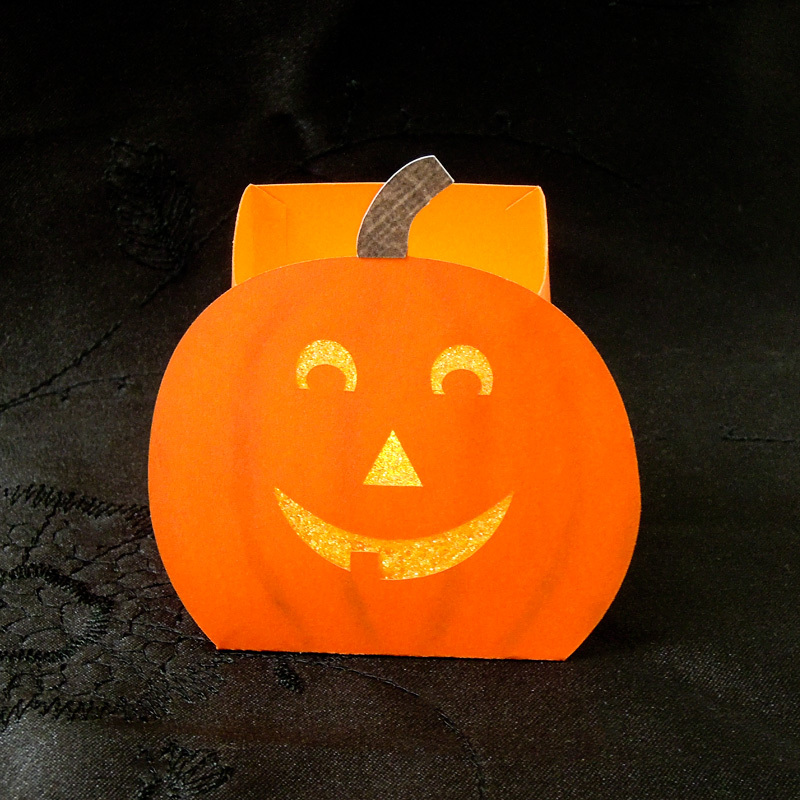 This time I made it smaller and put glittered transparency inside so that we can use it with an LED tealight. The download is a layered svg for use with SCAL2, SCAL3, and eCAL. This file is for personal use only. Feel free to link to this post, but the file is not to be shared or distributed in any way. Download the layered file from here. The single layer files were not changed and are still available here. Here is my seashell box in SVG, PDF, and AI formats. 🙂 The PDF is a vector PDF so it can be imported into a cutting program or can be used for printing and hand cutting. The files will make a box that is approximately 3″H x 3.5″W x 1.5″D when the file is imported at 4″ tall for the SVG and AI files and 9.1 inches for the PDF. The download includes a layered svg file for use with SCAL2 and a single layer svg file, layered AI file, and a PDF. These files are for personal use only. My files are for personal use only. Feel free to link to this post, but the files are not to be shared or distributed in any way. Hope everyone had a good weekend. 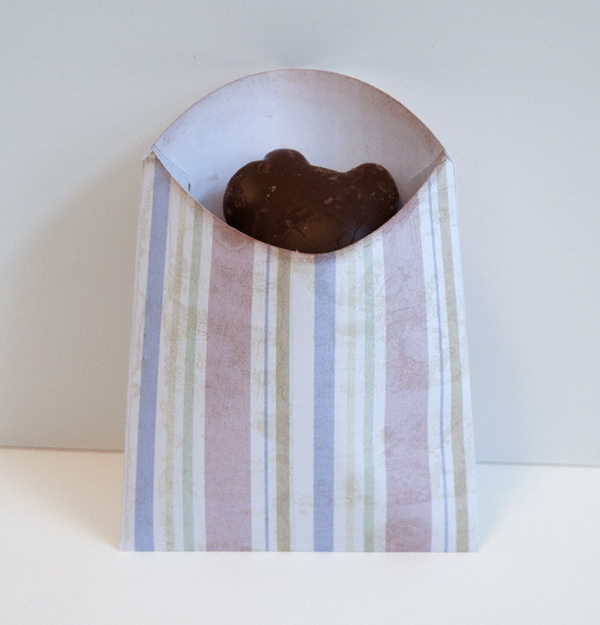 🙂 Here is a scoop front treat bag perfect for giving someone a little something in. This would also make a good pocket on a scrapbook page or card. The download includes two versions of this treat bag, one with score lines and one without. The download includes a layered svg file for use with SCAL2 and a single layer svg file. These files are for personal use only. Feel free to link to this post, but the files are not to be shared or distributed in any way. This svg file can be used in either version of SCAL. This file is for personal use only. Feel free to link to this post, but the file is not to be shared or distributed in any way. Here is a pumpkin bag for Halloween or fall. The layered svg file has four layers: one for scoring with solid lines, one for the bag, one for the face, and one for the stem. I cut the stem for my bag out of the same paper as the bag, and used markers to make it look like a stem. I used chalk on the front of the bag for more depth. You could use either a strip of paper or a ribbon for a handle if you wanted one. The download includes a layered svg for use with SCAL 2.0, and two single layer svg files for use with SCAL 1.0. These files are for personal use only. Feel free to link to this post, but the files are not to be shared or distributed in any way. Here is an svg template for the “Box in a bag” from Split Coast Stampers. Set the height at 5.5 inches for a bag that is approximately 5.5 inches tall with a base that is approximately 2.5 inches square. These files will make the same size bag with the Expression or the baby bug. The layered file has layers for scoring (with solid lines) and all of the components needed. I used the scoring layer with my blade upside down in the holder, then cut the base, scalloped border, and the two tabs out of the same paper. I then cut the rectangle out of the other paper. You could also use a paper trimmer for the sides since it is a simple rectangle. Glue the sides of the base. Apply a strong adhesive to one long and one short side of the rectangle. Wrap the rectangle around the base, lining up the edge of the paper with the bottom of the base. Attach the border to the bag in the same manner. You could also use a 11″ strip of your favorite border. Crease, glue, and attach the tabs to the top of the bag. Use ribbon or fibers to hold the bag closed. Enjoy! The download includes a layered svg for use with SCAL 2.0 and two single layer svg files for use with SCAL 1.0. These files are for personal use only. Feel free to link to this post, but the files are not to be shared or distributed in any way. There is a challenge right now at the Papyrus Jungle forum. A box or bag pattern was provided, and we were to see what we could do with it. 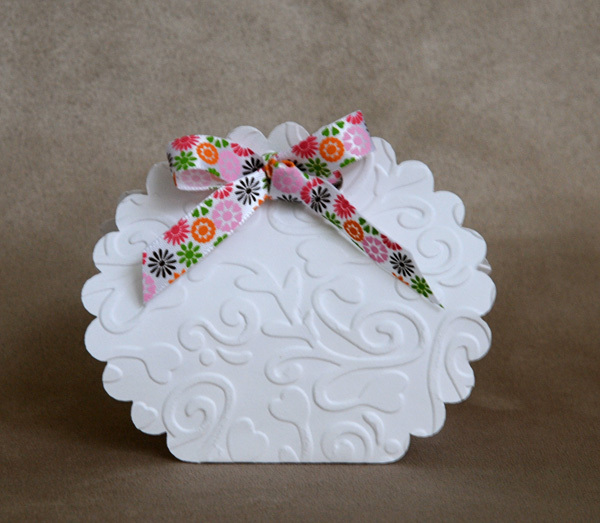 The image below shows a box made by Suzan using the original pattern. The obvious solution was to make it into a bunny box. In order to make a shaped face, I used Inkscape and relocated the side panels and added hair, the face, and face/body curves. Here is my box that I made. I left the facial features open, but they could have been backed with a contrasting paper instead. 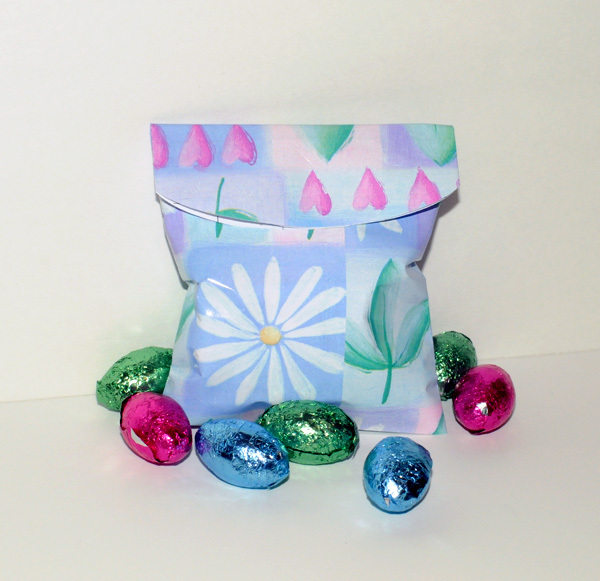 This would be cute with Easter grass and goodies, but I don’t have any Easter grass since my oldest cat eats it and then tosses his cookies. The face and bag are on different layers so that the face can be cut separately and pieced onto the bag.